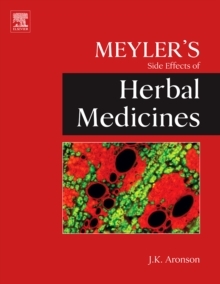 Meyler's Side Effects of Herbal Medicines, named to Doody's Core Titles for 2013, is a derivatrive work based on the acclaimed Meyler's Side Effect of Drugs, Fifteenth Edition. This book summarizes the adverse effects of a large range of herbal medicines and the active ingredients that they contain. It includes extensive lists of the families of plants that are used as herbal medicines, including the Latin names of genera and species as well as the common names of individual plants. It features not only herbal medicines but information on important compounds such as tropane alkaloids, cardiac glycosides, nicotine, and pyrolizidine alkaloids. The book is divided into three separate sections: Family - Each monograph is organized under a family of plants (for example, Liliaceae) Genera - The various genera that are included under the family name are tabulated (for example, the family Liliaceae contains 94 genera) Species - In each monograph, some species are dealt with separately (for example, in Liliaceae, four species are included under their Latin names and major common names) Each monograph includes the following information: Alternative common names Active ingredients Uses - both traditional and modern Adverse effects References Drug names are designated by their recommended or proposed International Non-proprietary Names (rINN or pINN); when those are not available, clinical names or brand names are used. The material is drawn from the fifteenth edition of the internationally renowned encyclopedia, Meyler's Side Effects of Drugs, and the latest volumes in the companion series, Side Effects of Drugs Annuals. This volume is critical for any health professional or homeopathic practitioner with an interest in herbal medicines.